Sharpening bands / emery belts for cloth cutting machines Eastman Maimin etc. 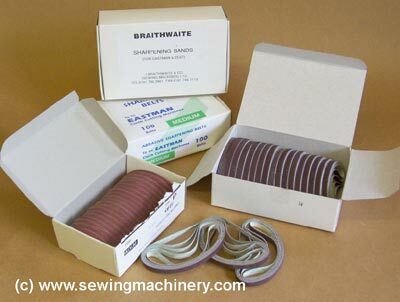 Quality emery sharpening bands / belts for use with straight knife cloth cutting machines..
Fine 120 Grit: synthetic, knitted, loosely woven, and silk cloth/material etc. Medium 100 Grit: Cotton, light woollens and suiting cloth/material etc. Course 80 Grit: for use with: tightly woven, denim, rainwear and other medium type cloth/material etc. Rough 60 Grit : for use with heavy denim, heavy rainwear, leathers and coated cloth/material etc. When ordering please have the make & model of machine ready.